I'm going to go ahead and say something: I don't understand people who say they like white meat more than dark. Or to an even higher degree, people who don't like dark meat at all. To me, in comparison to dark meat, white meat is so dry and flavorless, it may as well be cardboard. Really, what kind of person chooses a breast over a drumstick?! Well. Aside from a healthy one, that is. Heat the oven to 375 degrees. Cover the bottom of a heavy 8-quart casserole with one-third of the celery, onions, garlic, parsley, and tarragon. Place the oil in a shallow dish. Dip one-third of the chicken pieces into the oil, coating all sides evenly, and place in the casserole. Sprinkle with one-third of the salt and pepper and a few gratings of the nutmeg. Repeat to make 2 more layers. Pour the vermouth over the chicken. Cover the casserole tightly with aluminum foil and fit the lid over the foil to create and airtight seal. Bake for 1 1/2 hours, without removing the cover. Check the chicken for doneness; return the casserole to the oven if the chicken seems underdone. 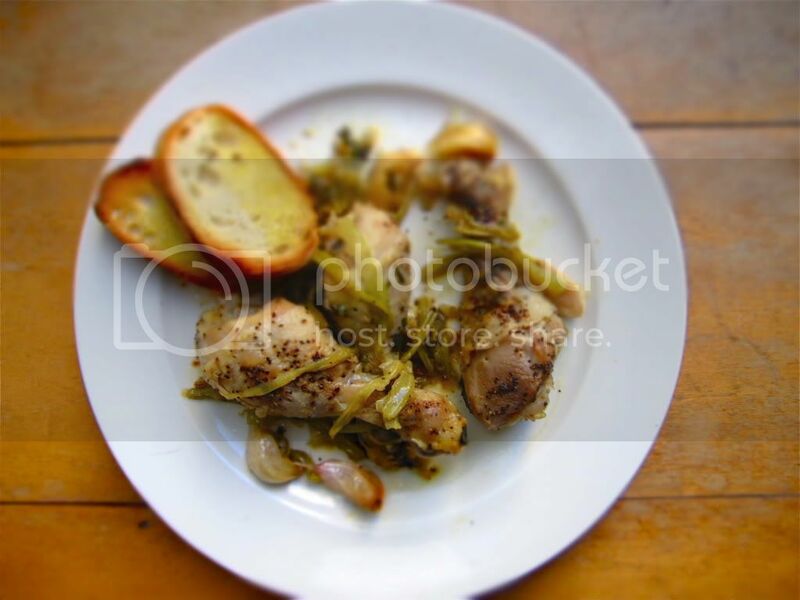 Serve the chicken along with the pan juices, the garlic, and thin slices of French bread to be spread with garlic squeezed from the root ends of the cloves. i love alton's garlic with 40 cloves, but his calls for peeling the garlic (and a whole chicken, so you can pick your favorite part), so this unpeeled version looks much easier in comparison!